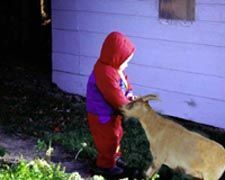 In this short clip obtained from the internet, an unknown child is repeatedly assaulted by a goat displaying frighteningly blood-thirsty behavior at a very young age. It was early Spring. The snow had just melted. Brandon D. went out to play. 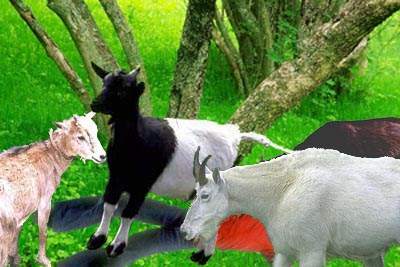 While in his own backyard, he was attacked by a bloodthirsty roaming goat. 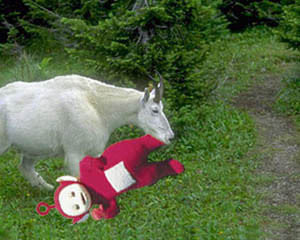 An unfortunate petting zoo incident. Rachael M. was innocently looking at a deer when the goat in this picture knocked the poor thing to the ground and trampled her. This scene took place at a site outside of Pocatello, ID. The CGTF was conducting surveillance on the farm as a result of some interesting tips it had received. One of the midget farm workers was herding a group of goats back to the barn for the night when suddenly they turned on him. Unfortunately, help arrived too late. Not even celebrities are safe. Po was riding her scooter when this goat came over the hill towards her. 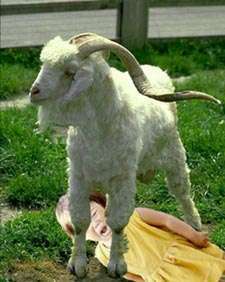 She tried to get away but the goat soon overpowered poor Po. 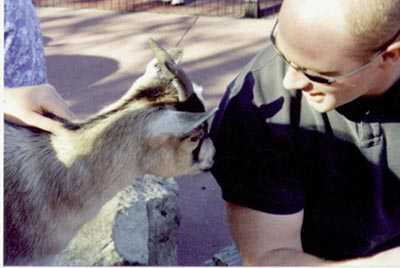 In the picture taken just seconds after this one, judged too graphic for the Internet, half of Sean's arm was ripped off by this goat. Gangrene set in to the remains before he could get medical attention and he ended up losing his entire arm.